I lost her just five months ago. She had first been diagnosed with pneumonia, and then days later the news came that she had lung cancer. Lung cancer in dogs is rare, just 1% of dogs will be diagnosed. She was a rescue beagle. 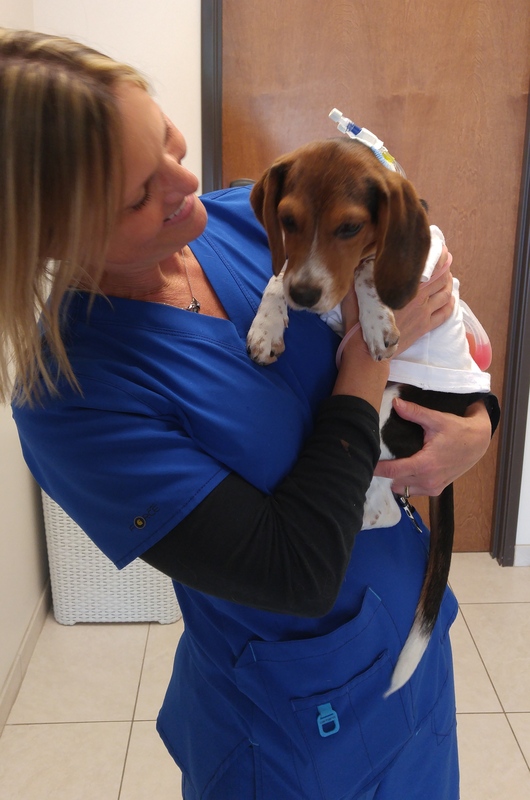 A sweet, gentle, loving, mild beagle named Skylar with brown eyes as big as saucers. When she passed away she was roughly eleven or twelve. Skylar changed me, for the better. She taught me monumental life-changing lessons of love and worthiness and gave me a taste of real unconditional love. The months that followed were hard. Immense pain and loss came to visit me one morning as we ran outside for a potty break before I left for work and as I clapped and called her up the steps, Skylar fell and rolled down the steps, suffering a heart attack. It was hard to smile, to laugh, and to find joy. Emptiness followed me for the next five months. The longing wouldn’t leave. I wanted another dog. I began to look online here and there, missing Skylar, but not ready to move on. 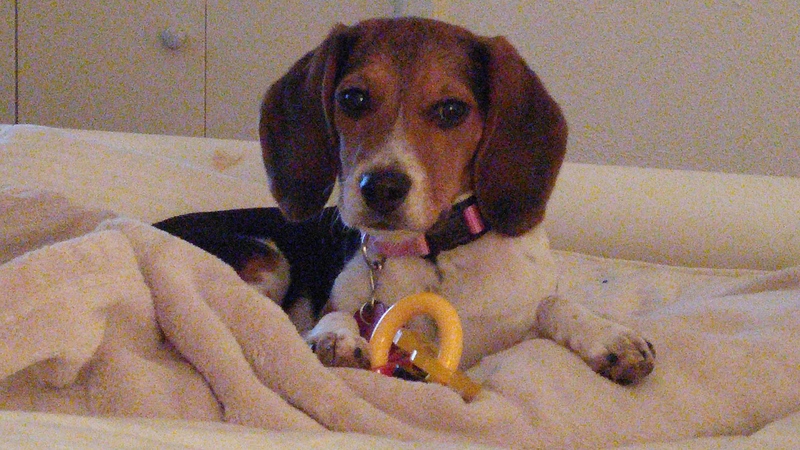 Until one night I stumbled upon a beagle that lived in San Antonio, she was just four months old. I pinged the owner, thinking the puppy was probably already spoken for. Her owner pinged me right back and before I knew it we arranged a time for me to pick up the puppy. I pulled up in the Buc-ee’s parking lot, nervous. I wondered, how this was going to work? You see, this was my first puppy. Skylar was a trained six-year-old dog when I adopted her. Her personality might lead you to believe she may have been mistreated in prior years. She was chill. She didn’t love to play, but loved tummy rubs and walks. As a puppy mom to be, I had the jitters as I waited for the car to pull up containing a 15lb beagle who would open up a whole new world for me. The car I was anxiously waiting for pulled up next to me. The guy got out of the car and pulled this little beagle out and put her into my arms. It was love at first site in the parking lot of Buc-ee’s. She was a little, lean, sweetheart of a beagle with deep dark colors. She was nervous and chewed on my hand all the way back home. I named her Scout. The next two days were unbelievable. That afternoon I got a call that I needed to come home immediately. Scout was screaming with pain and running in circles. We rushed to the emergency room and tests revealed she had a septic stomach. The doctors gave me two options. You can put her down. Or we can go in and repair the hole her intestine and flush her stomach. I was in complete disbelief. Just days prior I had made my final credit card payment, having spent six years digging out of debt. The surgery would run anywhere between $5,000-$10,000. Gulp. I cried. I prayed. My heart was torn. The surgeon called me at 2AM and said that she made it through the surgery. The earring they thought was in her stomach turned out not to be there at all. In fact, there was no foreign object. Scout had a 50/50 chance of making a full recovery. Ever day Scout was in ICU we racked up another $1,800, and she was not out of the woods. I prayed. I believed that God would not give me this precious gift only to take her away. I had much to learn here and God was going to come through, in EVERY way. Seven days passed. The highs and lows, mostly lows, were enough to make you feel as though you were on a bad roller coaster ride. The day finally came when we were discharged and ready to go back home. Home, a place Scout knew for just two days. We were in unchartered territory. But God was faithful, faithful to see us through to the end and onto a new beginning. I believe that we invest in what we believe in without attachment to the outcome. You showed me the way.